Before I left for vacation last week I searched my Second Helpings newsletters (the precursor of See Jane Cook) of a decade ago to find recipes worth a reprise. I was surprised that I made desserts so often back then. The desserts were pretty special, too. One example: Individual warm chocolate soufflés inverted onto plate and topped with thin disks of chocolate that melted on contact. Paging through the recipes reminded me of good times with old friends. Well, mostly. 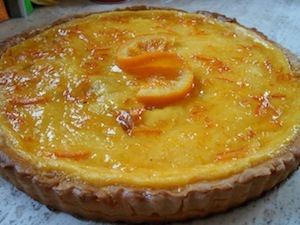 A recipe for Tarte au Citron reminded me of a bad marriage made briefly bearable one winter by a spur-of-the-moment weekend trip to Paris. Fares were on sale for about $300. How could we not go? We stayed at my favorite Paris hotel, Hotel Monge on the Left Bank. A romantic Paris cloaked in snow could not rekindle the flame of a long-dead love. I made frequent trips to the patisserie on the corner, where I comforted myself with lovely little custard tarts infused with the very essence of oranges. A better memory was attached to those warm chocolate soufflés. I remember recreating the dessert after eating a miniature version one warm fall evening on a terrace in Kansas City. The best chefs in the region were scattered over the terrace and grounds, serving tastes of their signature dishes. Amid all the barbecue was that elegant little gem. I was entranced with the genius and ease of the chocolate topping. The Sicilian Cassata recipe I found took me back 32 years, to when my interest in food was germinating. Dinner at a friend’s home was a whole filet mignon carved at the table, the first salade Nicoise I’d ever tasted and a voluptuous cassata that to me was heaven itself. Recipes for the Italian layer cake abound. The one Doris made was vanilla sponge cake layers filled with gently sweetened ricotta cheese studded with bits of chocolate. The cake was coated with a shiny chocolate ganache. It was my introduction not only to ganache but to the concept of dinner parties. Although I’ve all but given up fancy dinner parties, I still love cassatas, and Doris is still a good friend. In a large bowl, whisk eggs to blend. Whisk in sugar just until combined. Add orange juice, orange rind and cream. Whisk just until mixed. Pour into the baked pastry shell. Bake tart on the center oven rack at 350 degrees for 25 to 30 minutes, until filling is set. Cool on a wire rack. Heat marmalade in a custard cup in a microwave oven just until runny. Spread over cooled custard. Broil until bubbly, but do not burn. Cool to room temperature. Garnish with a paper-thin orange slice if desired. Place flour and salt in the bowl of a food processor and blend. Add butter and process until blended, about 10 seconds. With machine running, add ice water through feed tube until mixture begins to form a ball, about 10 seconds. Turn onto a work surface and smear dough bit by bit until the butter and flour are well blended. Form into a disk, wrap in plastic and chill at least 1 hour. Warm dough slightly and divide in half, saving half of dough for another use. Roll out half of dough to an 11-inch round. Fit into tart pan without stretching. Fold under any overhang to form a double-crusted side. Trim dough even with the top of the tart pan. Prick all over with a fork. Mold foil to the inside of the shell and weight with dried beans or pie weights. Bake at 400 degrees for 15 minutes. Remove foil and weights and bake 10 minutes longer, or until lightly browned. Cool before filling. Melt chocolate in a double boiler. Whisk in the melted butter. Remove from heat. In a small bowl, beat egg yolks and flour until pale-yellow in color. Add the yolk mixture to the chocolate and stir well. Beat egg whites until foamy. Gradually add sugar while beating until medium-stiff. Immediately fold the warm chocolate mixture into the meringue. Spoon into 8 buttered and sugared 6-ounce ramekins or custard cups. Fill the ramekins completely. Bake at 375 degrees for 8 to 10 minutes. When the soufflés are baked (and still warm), flip them out of the ramekins, upside down. Place a thin round disk of milk chocolate on top of each soufflé and allow to melt. Garnish the plates with berries. Serve immediately. Serves 8.
size and shape as the soufflé dishes, using a cookie cutter or sharp paring knife. Split the cake into 3 layers if using the sponge cake. Beat cheese with an electric mixer until smooth. Beat in sugar, vanilla and cognac. Stir in chocolate bits. Place the cake bottom on a serving plate. Spread half of the ricotta mixture over cake. Top with middle layer, then remaining ricotta mixture. Place top layer over cheese mixture. Break bittersweet chocolate into pieces and place in a small bowl. Heat cream almost to boiling. to drip down the sides. Chill.